The Chamber of Deputies is open to all. 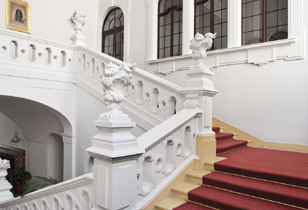 The Chamber of Deputies is open to all citizens of the Czech Republic as well as foreign visitors. Come and personally look at the deliberations of the Chamber of Deputies in the Assembly Hall or at the meeting of any of the Chamber's committees. You can also arrange a guided tour of the historic seat of the Chamber of Deputies. Information on events in the Chamber of Deputies are provided by the Information Centre every weekday. You can watch meetings of the Chamber of Deputies from the visitors' gallery. The meetings of committees and commissions are usually public and can be visited. We arrange guided tours for organized groups. We organize Open House Days on the occasion of the public holidays on May 8 and October 28. You can view the buildings of the Chamber of Deputies on panoramic photographs. will walk you through the history and present of the Chamber of Deputies.